USS SHREVEPORT was laid down on December 27, 1965 by Lockheed Shipbuilding and Construction Company of Seattle, Washington. She was launched on October 22, 1966 and sponsored by Mrs. Andrew McBurney Jackson, Jr. She was commissioned on December 12, 1970 with Captain Peter H. Pehrsson in command. SHREVEPORT departed Norfolk, Virginia, in early January of 1973 for her first deployment with the Sixth Fleet in the Mediterranean Sea. She served as flagship for Commander, Amphibious Squadron Two. During this deployment, she visited ports in France, Italy, Greece, Crete, and Turkey before returning to the United States in July of that year. The "Super Gator", as her crew dubbed her, deployed again to the Mediterranean Sea in July of 1975 with Commander, Amphibious Squadron Two again embarked. Following Christmas at Palma, Spain, SHREVEPORT returned to Norfolk in early February of 1976 having sustained damage on the bow and flag bridge from a massive forty-foot wave, known as the "North Wall Effect", off of Cape Hatteras, North Carolina. In late August of 1976, SHREVEPORT deployed to Northern Europe as flagship for Commander, Amphibious Squadron Eight. During the two and one-half month cruise, the ship participated in two major NATO amphibious assault exercises and visited ports in Sweden, West Germany, the Netherlands, and the United Kingdom. In September of 1979, SHREVEPORT began another deployment to the Mediterranean Sea, returning to Norfolk in February of 1980. In August of that year, her crew earned the Humanitarian Service Medal for their on-scene assistance to the Cuban Flotilla in the Florida Straits. In September of 1981, SHREVEPORT visited Cancun, Mexico while supporting the attendance of the President Ronald Reagan at the North-South Economic Summitt Conference. In August of 1982, SHREVEPORT departed Norfolk to return to the Mediterranean as flagship for Commander, Amphibious Squadron Six. She joined the multi-national force in September and served for four months off the coast of Beirut, Lebanon before returning to Norfolk in March of 1983. She was awarded the Navy Unit Commendation and the Navy Expeditionary Forces Medal for her operations off of the Lebanese coast. SHREVEPORT returned once more to the Mediterranean in July, 1984. While in Rota, Spain, she received mission tasking to off-load her embarked Marines and to embark Helicopter Mine Countermeasures Squadron Fourteen (HM-14). Crossing the Mediterranean and transitting the Suez Canal in world record time, she participated in Operation Intense Look, conducting mine clearance operations in the Red Sea. For her actions in support of this critical operation, SHREVEPORT was awarded the Meritorious Unit Commendation. Later in the deployment, she was called to action off the Lebanese coast. Following the bombing of the US Embassy in Beirut, SHREVEPORT provided critical medical evacuation and logistics support services. After making port calls in Marseille, France, and Malaga and Rota, Spain, she returned to Norfolk. In May of 1985, SHREVEPORT was present for the opening ceremonies of the Tennessee-Tombigbee Waterway in Mobile, Alabama. On her return trip to Norfolk, she logged her 25,000th helicopter landing. Later in the year, she was involved in several minor underway exercises and began making preparations for a shipyard overhaul. In October, she departed Norfolk bound for overhaul in Brooklyn, New York. While in the shipyard, the ship underwent extensive refurbishment, modernization, and upgrade. She returned to Norfolk in July of 1987. After several weeks at sea in December of 1986 and January of 1987, SHREVEPORT departed Norfolk for refresher training at Guantanamo Bay, Cuba. Upon successful completion of training, she returned to Norfolk in March. One month later, she participated in Exercises Solid Shield '87 in preparation for her upcoming deployment. In September, she departed for the Mediterranean. Embarked with Marines of the 22nd Marine Expeditionary Unit (22nd MEU), SHREVEPORT - along with USS NASSAU (LHA 4) and USS MANITOWOC (LST 1180) - composed the first Mediterranean Amphibious Ready Group (MARG) to deploy in conjunction with a regularly scheduled Aircraft Carrier Battle Group (CVBG) deployment. She participated in several amphibious exercises, including a joint MARG/CVBG fleet exercise and Exercise African Eagle off the Moroccan coast. 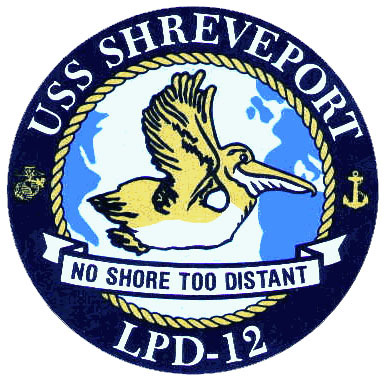 SHREVEPORT arrived in home port in March of 1988. That following June, the ship entered the Metro Machine Corporation shipyard in Norfolk where she underwent four months of repair, upgrade, and refurbishment. Six months later in January of 1989, she departed Norfolk for refresher training at Guantanamo Bay, Cuba before deploying again to the Mediterranean. While there, she visited ports in Spain, France, Israel, Egypt, Italy, and Portugal. A scheduled visit to Toulon, France was abruptly canceled when SHREVEPORT was suddenly tasked to support the American Embassy evacuation operations in Beirut. She conducted numerous evacuation rehearsals with US Air Force, Army, and Marine Corps helicopters operating from her flight deck. November of 1989 saw the "Super Gator" returning to Norfolk and the Metro Machine Corporation shipyards for another maintenance availability. She was underway again in June of 1990 and spent the majority of the summer months conducting local operations and exercises in preparation for a deployment to Northern Europe. That deployment was canceled when SHREVEPORT was tasked to deploy to the Middle East in support of Operation Desert Shield. SHREVEPORT departed Norfolk on August 15, 1990 with Commander, Amphibious Squadron Six embarked. 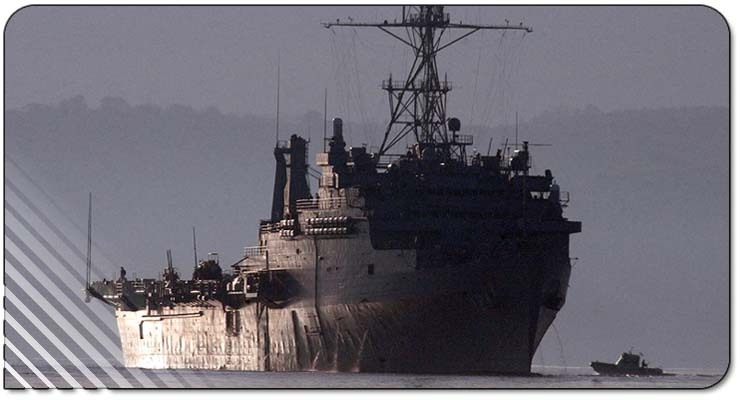 During Operations Desert Shield and Desert Storm, she logged more than 40,000 nautical miles and served as the primary control ship during the four "Sea Soldier" amphibious assault exercises. The amphibious task force was the largest assembled since the landings at Inchon during the Korean War. The ship also participated in the intercept of the Iraqi ship IBN KHALBOON and the processing of enemy prisoners of war. Following an eight-month deployment, SHREVEPORT returned home to Norfolk on April 17, 1991. In January of 1992, SHREVEPORT was awarded the Arleigh Burke Fleet Trophy for outstanding readiness and performance during her deployment to the Middle East in Operations Desert Shield and Desert Storm. In November of 1993, SHREVEPORT was assigned to the coast of Mogadishu, Somalia in support of Operation Restore Hope. Just two months later in January of 1994, she was present in the Adriatic Sea taking part in Operation Provide Promise and flying reconnaissance missions over Bosnia-Herzegovina. From December of 1995 through February of 1996, she provided support of the enforced no-fly zone over the war-torn republics of the former Yugoslavia (Operation Deny Flight) and the air drop of humanitarian aid to the residents of the city of Sarajevo (Operation Provide Promise). She also provided support of Operation Joint & Decisive Endeavor.